Grab your tinfoil hats, sheeple. 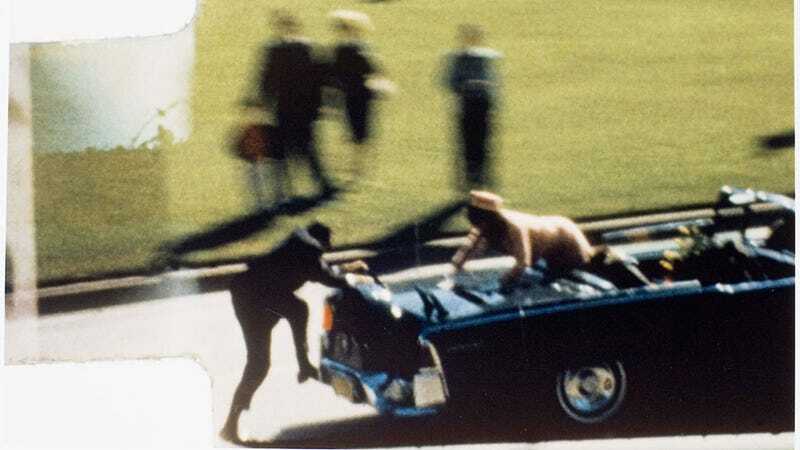 It's been fifty years since President John F. Kennedy was assassinated on that fateful day in Dallas, and it's still nearly impossible to discuss the event without some mention of conspiracy, cover-ups, government intrigue, multiple shooters, UFO affiliations, and more. Now, the conversation has been given a thoroughly modern twist—as an app, natch. The Grassy Knoll Report jams a half-century's worth of hi-def images, dates, profiles, narratives, and half-baked pseudo-connections into an interactive exploration of everything to do with November 22nd, 1963. The app was conceived by Joe Williams, a writer and film critic for the St. Louis Dispatch, whose main homepage appears to be a plain text website. It lays out a basic FAQ on the subject that absolves Oswald and outlines "plausible suspects," while offering an expansive evaluation of "evidence" by credible witnesses and experts, and it looks... like an outdated screed by a zealous theorist, to be honest. The app, on the other hand, is cleanly designed and easy to navigate. It's broken down into scenes—from "10th and Patton" to "Beneath the Police Station"—each of which links with pics. There is a timeline and a wide-ranging cast of characters. Scrolling through is a bit of an adventure in itself. Is it the same material as Williams presents on his website? Probably—albeit way, way more in-depth. The app, while straightforward, weaves together a complex story, accessible and approached from all kinds of angles—it demands engagement, whether you agree with the perspective or no. Comparing the two raises an interesting question about the way we process information. Smart packaging won't necessarily transform a skeptic into a believer, but it can certainly influence how we connect with what we consume. What if everyone with a crackpot concept they wanted to share with the world was also an ace graphic designer? If every bizarro, ill-conceived concept was laid out online like Snow Fall? We can all giggle at how goofy Geocities sites look now—because c'mon, it's all but impossible to take anything seriously that looks like that—but, at some point, all the stuff you're reading now will appear equally out of date. EVEN THIS POST. You can purchase The Grassy Knoll Report for $0.99 in the iTunes store—and you can post all your whodunit ideas below.